This document is a technical summary of the unpublished Federal Highway Administration report The Universal Simple Aging Test (USAT) and Low Temperature Performance Grading Using Small Plate Dynamic Shear Rheometry: An Alternative to Standard RTFO, PAV, and BBR for HMA and WMA. This TechBrief provides an overview of the Universal Simple Aging Test (USAT), which is an alternative to use of standard rolling thin-film oven (RTFO) and pressure aging vessel (PAV) testing for asphalt binders. Also, the USAT can be applied to emulsion residue recovery and oxidative aging of the residue. The USAT is a new thin-film (300 μm) short- and long-term aging test developed by Western Research Institute (WRI), with funding and guidance provided by the Federal Highway Administration (FHWA). USAT is proposed as an alternative to standard RTFO and PAV testing. The RTFO is not suitable for simulating the oxidative aging that occurs during “warm” mix production and is problematic for aging highly modified binders. (Modified binders tend to creep out of the bottle.) The USAT resolves both of these issues. The USAT short- and long-term aging scheme is illustrated in figure 1. The plate dimensions were selected so that the plate can be inserted directly into a standard PAV tray. USAT short-term aging for 50 min at 150 ºC is approximately equivalent to standard RTFO testing (85 min/163 ºC). USAT short-term aging for 50 min at 130 °C approximately simulates “warm” plant aging in the field. One USAT plate generates about 3 g of aged binder, and several plates can be aged at the same time. Three g of binder is sufficient to characterize the high-, intermediate- and low-temperature rheology, include bending beam rheometer (BBR) m-value and creep stiffness. Before the Strategic Highway Research Program (SHRP), there was considerable interest in static thin-film aging, which is the basis for the USAT. However, the RTFO test was adopted for short-term aging because of the large amount of aged asphalt needed for the BBR test. Figure 1. Illustration. USAT short- and long-term aging scheme. What is the Rationale for Developing a Thin-Film Aging Test as an Alternative to Standard RTFO and PAV Testing? There was considerable interest in static thin-film aging before SHRP. However, the RTFO test was adopted during SHRP for short-term aging because of the large amount of aged asphalt needed for the BBR test. Since its adoption, RTFO has been problematic for aging highly modified binders. In the case of warm mix binders, RTFO testing at lower temperature to simulate a “warm” plant limits the rolling needed to uniformly age the material. The USAT eliminates the “rolling” issue for polymer modified and warm mix asphalts (WMA). Recent development at WRI of a 4-mm diameter parallel-plate DSR technique allows DSR testing to -40 °C, and requires only 25 mg of binder. The technique is commonly referred to as 4-mm DSR. By combining 4-mm DSR with the USAT, the high-, intermediate-, and low-temperature rheology of short- and long-term aged asphalt binders can be determined, including m-value and creep stiffness, as well as the thermal stress buildup in the binder and mix from a cooling event. The USAT also generates sufficient aged material to perform high-temperature DSR using 25-mm diameter plates. The key advantage of the RTFO test, compared with static aging tests such as the thin-film oven test (ASTM D 1754), is the increased surface exposure in the RTFO because of the rolling action of the glass vessels. However, the amount of rolling and exposure of fresh faces from one asphalt to another varies with the viscosity of the asphalt before the test and the change in viscosity that occurs during the test. The flow and mixing of asphalt binder in the bottles is further complicated when the asphalts are polymer modified. Turning down the temperature in the RTFO to simulate the oxidation that occurs during WMA production causes similar complications. This reduction or elimination of rolling during the RTFO test with highly modified asphalts has been well known for a number of years. There have been several attempts to resolve the problem by, for example, introducing a metal rod into the RTFO bottle to induce film spreading. Testing performed by FHWA and the Southeast Asphalt User Producer Group concluded that metal rods reduced the extent of aging of modified and unmodified asphalt binders and resulted in both types of binders creeping out of the bottles. The USAT is a robust alternative to RTFO testing that can be used in the laboratory to simulate the oxidative aging that occurs in a hot or warm plant and to recover and conduct longer term aging of the emulsion residue. One of the principal goals during development of the USAT was to make the asphalt film thin enough to reduce diffusion effects. The USAT film thickness of 300 μm was determined by trial and error in an effort to prepare uniform thin films without solvent casting. The amount of sample required for rheological and chemical testing was also considered. The USAT aging protocols are summarized in table 1. Table 1. USAT HMA and WMA binder aging protocols. Note: LT USAT PAV or LT USAT FDO samples are first aged using either the ST USAT HMA or WMA protocols. AASHTO = American Association of State and Highway Transportation Officials. FDO = Forced draft oven. Figure 2 is a sketch of the USAT plate. There are three slots on the plate to allow aging of three separate films. Each slot requires 1 g of asphalt binder, which produces a film thickness of about 300 μm. The plate is machined from standard 6.2-mm-thick 6061 (or 6013) aluminum plate. Figure 2. Illustration. USAT plate dimensions. Preparing a USAT sample involves bringing a hotplate to approximately 120 °C in a nitrogen-filled glove box or tent and then placing the USAT plate (with asphalt) onto the hot plate. As the temperature approaches 120 °C, the asphalt spreads out to cover roughly two-thirds of the slot surface. A small spatula is then used to spread the asphalt to the remaining uncovered surface, as shown in figure 3. After spreading, the asphalt is allowed to remain at 120 °C for several minutes to level and spread evenly. The USAT plate is then removed from the hotplate and allowed to return to room temperature while remaining in nitrogen. Figure 3. Illustration. Spreading asphalt to uncovered surfaces using a small spatula. The above method for preparing the USAT sample in nitrogen may not be necessary. It may be possible to simply prepare the sample in air without a glove box. Nitrogen was used during the development of the method to eliminate confounding variables, and tests were not conducted to specifically determine how much oxidation occurs during preparation of the USAT sample. The issue will be resolved during ruggedness testing. The rheology of a number of RTFO-, RTFO/PAV-, and USAT-aged binders have been compared, and for both short- and long-term aging, good agreement was found between USAT that was performed according to the aging protocols in table 1 and standard RTFO and RTFO/PAV aging. All of the asphalt binders either fell within or were close to falling within the single-operator precision limits for DSR, indicating good agreement between the USAT and RTFO and RTFO/PAV rheology. As previously noted, the key advantages of the RTFO test, compared with static aging tests, are the high air-flow rate and increased asphalt binder surface exposed to oxygen. The increased surface exposure in the RTFO is because of the rolling action of the glass vessels. Unfortunately, at the lower temperatures associated with WMA, there may be significantly reduced surface exposure to oxygen because of the increased viscosity of the asphalt binder at lower temperature. This fact is particularly true for polymer-modified asphalts. Generally, turning down the temperature in the RTFO to simulate the production of WMA is not a viable option because of the reduced rolling. The USAT short-term WMA aging protocol (table 1) appears to do a reasonable job of simulating the short-term aging that occurs in a “warm” plant. The USAT WMA aging protocol appears to cause a modest decrease in the continuous high-temperature grade for unmodified asphalt and a slight improvement for polymer-modified asphalt. On the low end, there is a modest improvement in continuous grade for the unmodified asphalts and a very slight decline for the polymer-modified asphalt. These results were compared with recovered binders from several WMA/HMA projects, and there were similar trends in the rheology of the recovered binder. Over the last several decades, a number of asphalt emulsion recovery methods have been developed, many of which involve temperatures well above the temperatures to which the emulsion product is exposed in the field. In the last several years, the focus has been on residue recovery that simulates field curing, particularly for polymer-modified emulsions because the high temperatures involved in distillation can significantly affect the modified emulsions by altering their two-phase structure. American Association for State and Highway Transportation Officials (AASHTO) PP 72 Standard Practice for Recovering Residue from Emulsified Asphalt Using Low-Temperature Evaporative Techniques Method B involves drawing down the emulsion using a wet film applicator on a silicon mat to an approximate film thickness of 380 µm. The 380-μm emulsion film is cured in a forced draft oven for 6 h at 60 °C. The residue thickness after curing can vary from about 190 to 300 μm depending on the ratio of asphalt to water. If there is interest in long-term aging of the recovered residue in accordance with AASHTO R28 Accelerated Aging of Asphalt Binder Using a Pressurized Aging Vessel (PAV), then the residue must be transferred to a suitable pan to provide the 3.2-mm film thickness required in R28. AASHTO PP 72 Method B does not produce sufficient emulsion residue to test with the BBR. However, the 4-mm DSR method only requires 25 mg of asphalt, effectively resolving the problem. Application of the USAT to recover and age emulsion residue is an improvement to PP 72 Method B and includes a simple, fast way to oxidatively age the emulsion residue if desired. Figure 4 illustrates the USAT emulsion residue recovery, aging, and testing scheme. There are three slots on the USAT plate to allow recovery and aging of three separate emulsion residue films. Each slot requires 1 g of asphalt, which produces a film thickness of about 300 μm. To achieve a 300-μm film of emulsion residue in each slot after drying, the asphalt-to-water ratio of the emulsion must be determined so the amount of emulsion placed in each slot will result in 1 g of emulsion residue. Figure 4. Illustration. USAT emulsion residue recovery, aging, and testing scheme. The USAT method is very comparable with the RTFO and RTFO/PAV testing regarding intermediate- and high-temperature linear and nonlinear rheological characteristics. By combining the USAT with 4-mm DSR, low-temperature rheology and specification parameters such as m-value and creep stiffness, typically obtained by BBR, can be determined from USAT samples. The time required to perform the short-term USAT aging is 50 min, which is 35 min less than required by the RTFO test method. Cleanup of the equipment after the test is also greatly simplified for the USAT when compared with the RTFO test. The time required to perform the long-term component of the USAT with the PAV is 8 to 12 h less than the standard PAV test. The only change in aging for HMA compared with WMA is adjusting the oven temperature from 150 to 130 °C. The USAT method is simpler than drawing down an emulsion using a wet film applicator on a silicon mat, and the USAT method results in a consistent 300-μm film regardless of the emulsion asphalt-to-water ratio. After the emulsion residue has been recovered on the USAT plate (recovery time is the same as Method B, i.e., 6 h at 60 °C in a forced draft oven), the plate has been designed so that it can be placed directly in a standard PAV and aged in accordance with AASHTO R28. Also, because the film thickness is only 300 μm rather than 3.2 mm, the time necessary for residue aging in the PAV is reduced from 20 to 8 h.
The large sample (50 to 100 g) required for BBR is no longer necessary. Four-mm DSR allows direct testing of the low-temperature rheological properties, including the dynamic moduli (G' and G"), and through interconversion the relaxation modulus G (t) and creep compliance modulus J (t). There is no extrapolation of intermediate temperature data. Farrar, M.J., Grimes, R.W., Sui, C., Planche, J-P., Huange, S-C., Turner, T. F., and Glaser, R., 2012, “Thin Film Oxidative Aging and Low Temperature Performance Grading Using Small Plate Dynamic Shear Rheometry: An Alternative to Standard RTFO, PAV, and BBR,” Preprint no. 05EE-467, Proceedings of the 5th Eurasphalt & Eurobitume Congress, Istanbul, June 13–15, 2012. Farrar, M.J., Planche, J-P., Grimes, R.W., and Qin, Q., 2014, “The Universal Simple Aging Test (USAT): Simulating Short- and Long-Term Hot and Warm Mix Oxidative Aging in the Laboratory,” Asphalt Pavements, Kim, Y.R., Ed., CRC Press, Taylor & Francis Group, London, pp. 79–87. 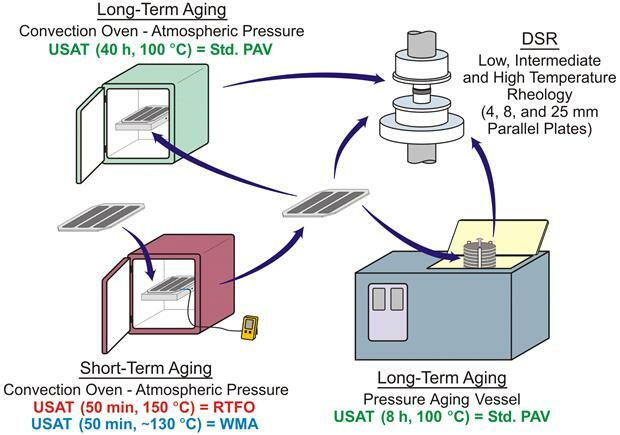 Farrar, M., Grimes, R.W., Turner, T.F., and Planche, J-P., September 2014, The Universal Simple Aging Test (USAT) and Low Temperature Performance Grading Using Small Plate Dynamic Shear Rheometry: An Alternative to Standard RTFO, PAV, and BBR for HMA and WMA, Western Research Institute, available at http://westernresearch.org/uploadedFiles/Transportation_Technology/FHWA_Research/Fundamental_Properties/Technical%20White%20Paper%20FP%2014--USAT.pdf. Farrar, M., Sui, C., Salmans, S., and Qin, Q., March 2015, Determining the Low Temperature Rheological Properties of Asphalt Binder Using a Dynamic Shear Rheometer (DSR), Western Research Institute, Laramie, WY, available at http://www.westernresearch.org/uploadedFiles/Transportation_Technology/FHWA_ Research/Fundamental_Properties/Technical%20White%20Paper%20FP%2008--4-mm%20DSR.pdf. Reinke, G., Ryan, M., Engber, S., and Herlitzka, D., 2014, “Techniques for Accelerating Recovery of Asphalt Emulsion Residues at 60 °C by Using Thin Film Procedures and Test Methods Suited to the Limited Amount of Residue Obtained to Characterize the Recovered Binder,” Transportation Research Circular E-C182, 90–114. Farrar, M.J., Salmans, S.L., and Planche, J-P., 2013, “Recovery and Laboratory Testing of Asphalt Emulsion Residue: Application of Simple Aging Test and 4-mm Dynamic Shear Rheometer Test,” Transportation Research Record, Journal of the Transportation Research Board, 2370, 69–75. Salmans, S., Farrar, M., Sui, C., and Planche, J-P., November 2013, Emulsions, Western Research Institute, Laramie, WY, available at http://www.westernresearch.org/uploadedFiles/Transportation_Technology/FHWA_Research/Fundamental_Properties/Technical%20White%20Paper%20FP%2018--Emulsions.pdf. Researchers— This TechBrief on the USAT was prepared by Western Research Institute (WRI) and is a cumulative result of several years of research conducted by WRI with the support of FHWA. Availability—The report may be obtained from the FHWA Product Distribution Center by e-mail to report.center@fhwa.dot.gov, fax to (301) 577-1421, phone to (301) 577-0818, or online at http://www.tfhrc.gov/safety. Key Words—Asphalt binder, asphalt aging, short-term aging, long-term aging.